[description] => Trisha will be playing a Christian character in her first Mollywood film Hey Jude. [articleBody] => If you are a fan of gorgeous and vivacious Trisha Krishnan then ready to rejoice as we have some awesome news in store for you. A recent pic of the actress is going viral on the social media and that too for all the right reasons. In the photo, she can be seen redefining the meaning of goofy with her funny antics on the sets of ‘Hey Jude’. Needless to say, this is bound to create a buzz amongst movie buffs and make us fall in love with her all over again. In case you did not know, ‘Hey Jude’ is the first Malayalam film of Trisha’s career. It is being directed by Shayamaprasad and is touted to be a story about self-discovery. Besides Trisha, it also features Nivin Pauly in the lead. Interestingly, a few days ago, a source had told a leading daily that Trisha will be seen playing the role of a Christian girl in this one. However, the source was quick to add that the character is different from the played by her in VTV. “Yes, she will essay a Christian girl in the movie. No doubt the Jessie character which brought out a different dimension of her is very close to her heart. Here, Trisha plays an inimitable character which is equally challenging,” the source had added. On a related note, this is a busy time for Trisha. Besides ‘Hey Jude’, she has ‘96’ in her kitty. It is touted to be a romantic-drama and also features Vijay Sethupathi in the lead. So did you like the photo? Comments, please! Trisha will be playing a Christian character in her first Mollywood film Hey Jude. 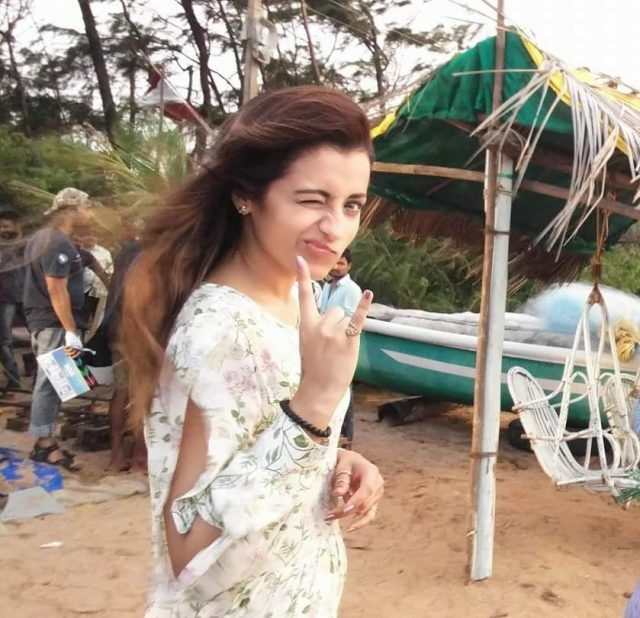 Trisha on the sets of Hey Jude. If you are a fan of gorgeous and vivacious Trisha Krishnan then ready to rejoice as we have some awesome news in store for you. A recent pic of the actress is going viral on the social media and that too for all the right reasons. In the photo, she can be seen redefining the meaning of goofy with her funny antics on the sets of ‘Hey Jude’. Needless to say, this is bound to create a buzz amongst movie buffs and make us fall in love with her all over again.